St. Joseph/St. Robert School students dance to fight childhood cancer. St. Joseph/St. 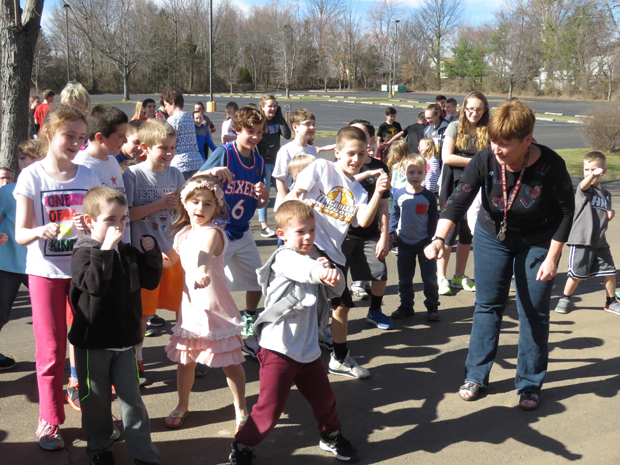 Robert School in Warrington held a “Dress Down Day” and hosted a “Dance Mini-THON” to support the efforts of Archbishop Wood High School’s Mini-THON and the Four Diamonds movement to conquer childhood cancer. The students at St. Joseph/St. Robert School raised $459 which added to the total of $56,272 raised by the students at Archbishop Wood. Four Diamonds fights childhood cancer by assisting children treated at Penn State Hershey Children’s Hospital and their families. Each year the organization supports approximately 600 children with cancer – 100 who are newly diagnosed and 500 who are continuing their fight.